Objectives To investigate a possible association between normal tension glaucoma (NTG) and an increased risk of developing Alzheimer’s disease (AD). Setting NTG group and the comparison group were retrieved from the whole population of the Taiwan National Health Insurance Research Database from 1 January 2001 to 31 December 2013. Participants A total of 15 317 subjects with NTG were enrolled in the NTG group, and 61 268 age-matched and gender-matched subjects without glaucoma were enrolled in the comparison group. Primary and secondary outcome measures Kaplan-Meier curves were generated to compare the cumulative hazard of AD between the two groups. A multivariable Cox regression analysis was used to estimate the adjusted hazard ratios (HRs) of AD, adjusted for diabetes, hypertension, hyperlipidaemia, coronary artery disease and stroke. Furthermore, risk factors for developing AD among the NTG group were investigated. Results The mean age of the cohort was 62.1±12.5 years. Patients with NTG had significantly higher proportions of diabetes, hypertension, hyperlipidaemia, coronary artery disease and stroke than the comparisons. Patients with NTG had a significantly higher cumulative hazard for AD than the comparisons (p<0.0001). In the multivariable Cox regression after adjustment for confounders, the NTG group had a significantly higher risk of AD (adjusted HR 1.52; 95% CI 1.41 to 1.63). Moreover, in the NTG group, when we compared the effects of different types of glaucoma eye drops, none of the eye drops used were significant risk factors or protective factors for AD. Conclusions People with NTG are at a significantly greater risk of developing AD compared with individuals without glaucoma. Among patients with NTG, none of the glaucoma eye drops used significantly changed the risk of subsequent AD. The study used the comprehensive, whole national population database with a long study period to investigate the relationship between normal tension glaucoma (NTG) and Alzheimer’s disease (AD). The cohort study design and survival analysis would elucidate the association between NTG and subsequent risk of developing AD. Possible confounders were adjusted in the Cox regression to derive the more real correlation between NTG and AD. Glaucoma is a chronic, progressive disease with characteristics of retinal ganglion cell (RGC) loss, retinal nerve fibre layer (RNFL) thinning and optic nerve atrophy.1–3 Elevated intraocular pressure (IOP) plays an important role in the development of glaucomatous optic neuropathy. However, 30%–92% of primary open-angle glaucoma (POAG) have IOP within the normal range and are classified as normal tension glaucoma (NTG).2 4–7 NTG occurs because of a fragile optic nerve that can be damaged despite a normal IOP, or because of mechanisms other than an elevated IOP (eg, insufficient ocular perfusion pressure or autonomic dysfunction).8–13 Without treatment, NTG leads to optic nerve atrophy, progressive visual field loss and even blindness. The mainstay treatment for NTG, similar to the therapy for other types of glaucoma, is aimed at reducing IOP with glaucoma eye drops. NTG and AD have common features. Both of them are chronic, progressive neurodegenerative diseases with an age-related and female-predominant incidence.16 In structural and pathological studies, patients with AD exhibit RGC loss and RNFL thinning, similar to patients with NTG.17–20 In genetic studies, the epsilon 4 allele of apolipoprotein E (APOE), which is a risk factor for late-onset AD, has been observed in the pathogenesis of NTG.21 The optineurin gene has also been found to be associated with both AD and NTG.22 23 In addition, in clinical, cross-sectional studies, Bayer and Tamura et al have found an increased prevalence of glaucoma in patients with AD.24–26 All of these may imply that glaucoma and AD share similar pathophysiological or underlying mechanisms. However, population-based cohort studies evaluating the association between glaucoma and AD have revealed inconsistent findings. The Three-City-Bordeaux-Alienor study conducted in France showed that patients with open-angle glaucoma (OAG) were four times more likely to develop dementia during the 3-year period.27 In a Taiwan registry study, Lin et al also found a significantly higher risk of developing AD among the POAG patients.28 In contrast, there was no increased risk of developing AD among the NTG patients in a Danish registry study and among the patients with POAG in a population-based study in Sweden.29 30 The discrepancies may be due to the insufficient statistical power, non-equivalent study designs and different diagnostic criteria. The objective of our study was to investigate whether patients with NTG have a higher risk of developing AD than controls using the National Health Insurance Research Database (NHIRD) in Taiwan. We used the whole population database, and therefore had large numbers of patients and a high level of statistical power. In addition, the NHIRD adopted the International Classification of Diseases, Ninth Revision, Clinical Modification (ICD-9-CM) codes, which are generally accepted worldwide. Thus, our results can be clearly interpreted and compared with further studies in other countries. The National Health Insurance (NHI) programme of Taiwan covers the healthcare services of greater than 99% of Taiwan’s 23 million residents. The NHIRD is maintained by the National Health Research Institutes of Taiwan and includes inpatient and outpatient medical benefit claims. In NHIRD, the diagnoses were accurate and were verified by the National Health Administration (NHA). The NHA not only checks the consistencies between the claimed data and the charts but also makes sure the patient received a standard protocol of examinations to confirm the diagnoses. To ensure confidentiality, the identification of all patients in the database was encrypted prior to releasing data for research purposes. Therefore, according to the rules of the Institutional Review Board, written informed consent was waived. Based on the healthcare claims of the entire population, we sought to compare the hazard of AD in subjects with and without NTG during the 13-year period. Patients were not directly involved in the design of this study. Using the Taiwan NHIRD from 1996 to 2013, we performed a retrospective cohort study. We first selected patients with NTG (ICD-9-CM codes 365.12) from 1 January 2001 to 31 December 2013. Patients with NTG diagnoses from 1 January 1996 to 31 December 2000 were excluded to ensure that our patients with NTG were newly diagnosed. The date of the first NTG claim was defined as the index date. Those who had never received a diagnosis of glaucoma were randomly selected as a comparison group at a ratio of 1:4 and matched with the NTG group on age, gender and index year (the year of the index date or enrolment). The two groups were followed up to see whether they developed subsequent AD. Follow-up time was calculated from the index date (enrolment date) to the date of AD diagnosis, death or the end of 2013, whichever occurred first. The diagnosis of AD (ICD-9-CM codes: 331.0) was confirmed by neurologists or psychiatrists through a well-acknowledged, standard diagnostic protocol. Subjects who received a diagnosis of AD or dementia before the index date or enrolment were excluded to ensure that the occurrence of AD was newly diagnosed. After investigating the two groups descriptively by age, gender and comorbidities, the group differences were analysed by the two-sample t-test (for continuous variables) and χ2 test (for categorical variables). Survival analysis using the Kaplan-Meier method with the log-rank test was applied to describe and compare the cumulative incidence curves of AD. A Cox proportional hazard model was used to estimate the hazard ratio (HR) for the occurrence of AD according to each variable in the univariate and multivariate analyses. Variables included in the regression analysis were age, gender and comorbidities, including diabetes, hypertension, hyperlipidaemia, coronary artery disease and stroke. Comorbidities were regarded as time-dependent covariates. We additionally performed stratified analyses according to age, in order to evaluate the risk factors for AD among different age subgroups. Then, using Cox proportional hazard model, we also explored the relationship between high-tension glaucoma (HTG) and AD, as well as the relationship between NTG and all dementia/dementia other than AD. Subsequently, we focused on the NTG group. The Cox regression was used to identify the risk factors associated with AD among patients with NTG. Variables included for analysis were age, gender, comorbidities and different types of glaucoma eye drops. Glaucoma eye drops were identified and classified by the National Drug Code and the Anatomic Therapeutic Chemical code. According to the classification system, types of glaucoma eye drops include α-agonists, parasympathomimetics (pilocarpine), carbonic anhydrase inhibitors, β-blockers, prostaglandin analogues and fixed combinations. All statistical operations were performed using SAS statistical package, V.9.2 (SAS Institute, Cary, North Carolina, USA). A total of 15 317 patients NTG and 61 268 matched controls were enrolled in the study. Table 1 displays the demographics of the two groups. The mean age in both groups was 62.1 years. The NTG group had a significantly higher proportion of diabetes, hypertension, hyperlipidaemia, coronary artery disease and stroke than the comparison group. During the 13-year study period, the cumulative incidence of AD was significantly higher in the NTG group (1023/15 317; 6.7%) than in the comparison group (2574/61 268; 4.2%). Age of AD onset was 73.8±8.1 years. Figure 1 illustrates the cumulative hazard curves for AD in the NTG group and the comparison group. A log-rank test revealed a statistically significant difference between the hazard curves of the two groups (p value <0.0001). 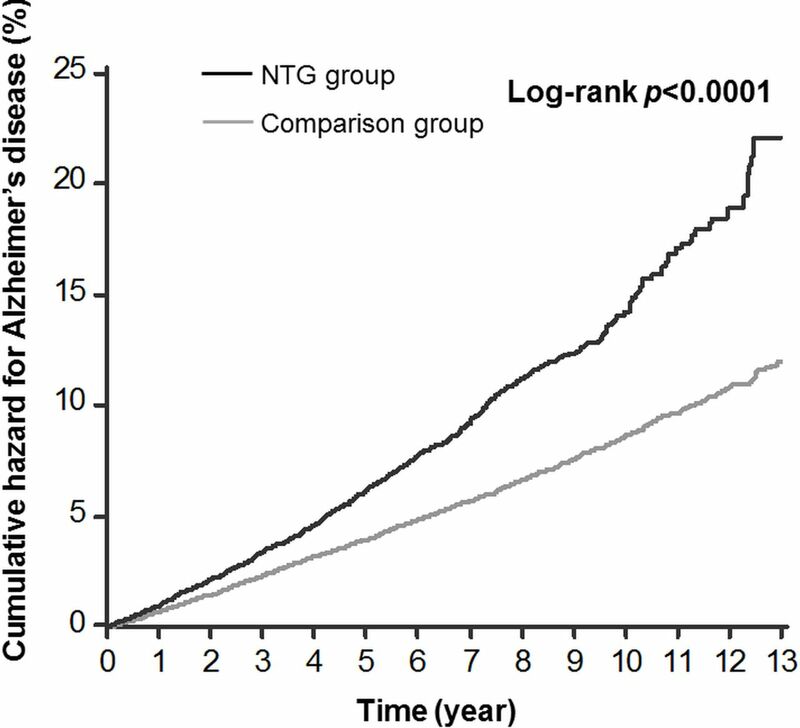 Kaplan-Meier curves for Alzheimer’s disease among patients with normal tension glaucoma (NTG) and the comparison group. The black line represents the NTG group and the grey line represents the comparison group. The unadjusted HR for AD was 1.66 times greater in the NTG group than in the comparison group (95% CI 1.55 to 1.79) (table 2). After adjusting for covariates, the significantly greater HR for AD in the NTG group remained (adjusted HR 1.52; 95% CI 1.41 to 1.63). Age was a significant risk factor for AD in both the univariate and multivariate analyses. The adjusted HR for AD in patients over 75 years old reached 38.85 when compared with those patients younger than 55 years old. Men were less likely to develop AD than women (adjusted HR 0.92; 95% CI 0.86 to 0.98). In the univariate analysis, patients with diabetes, hypertension, hyperlipidaemia, coronary artery disease or stroke had a significantly higher risk of developing AD. After adjustment for the covariates, only stroke remained a significant risk factor for AD (adjusted HR 1.73; 95% CI 1.61 to 1.87). In online supplementary table 1, subgroup analyses were also presented among individuals with older and younger age separately. Among subjects younger than 65, the adjusted HR for AD was 1.98 times greater in the NTG group than in the comparison group (95% CI 1.63 to 2.42); the other independent, significant risk factors for AD were female gender and stroke. Among subjects older than 65, in addition to these risk factors, diabetes also significantly increased the risk for AD (adjusted HR 1.02; 95% CI 1.01 to 1.12). Regarding the association between HTG and AD, the HR was non-significant (adjusted HR 1.12; 95% CI 0.89 to 1.36). In table 3, the relationship between NTG and dementia other than AD was also non-significant (adjusted HR 1.21; 95% CI 0.90 to 1.49). However, diabetes significantly increased the risk for dementia other than AD (adjusted HR 2.16; 95% CI 2.03 to 2.26). Table 4 displays the risk factors for AD among patients with NTG. Older age, female gender and stroke significantly increased the risk of developing AD among patients with NTG in univariate as well as multivariate Cox regression analyses. Moreover, when we compared the effects of different types of glaucoma eye drops, none of them were significant risk factors or protective factors for AD. We conducted a 13-year cohort study on population-based data from the Taiwan NHIRD. Compared with those without glaucoma, patients with NTG had a significantly higher risk (HR 1.52) of developing AD after adjustment for age, gender and comorbidities. Among patients with NTG, older age, female gender and stroke were significant risk factors for developing AD. However, the types of glaucoma eye drops were not risk factors or protective factors for AD among patients with NTG. Previous studies regarding the relationship between glaucoma and AD have mostly investigated the association between POAG and AD.27 28 32–34 Nevertheless, POAG includes NTG and HTG, which are distinctive disease entities. NTG has different features compared with HTG, such as IOP-independent mechanisms and characteristic patterns of structural/functional damage.31 35 Therefore, it is not clear enough to regard NTG and HTG as one to evaluate the subsequent risk of AD. One strength of our study is that we specified the association between NTG and AD. To the best of our knowledge, only one previous population-based study focused on the relationship between NTG and AD.29 Bach-Holm et al tracked 69 patients with NTG in Denmark for a mean follow-up period of 12.7 years and did not find any significantly higher risk of developing dementia/AD compared with the general population. In fact, none of those 69 patients with NTG subsequently developed AD. Statistically, the case numbers were too small to perform analyses effectively. It is another strength of our study that we included over 15 000 patients with NTG from our nationwide database. Thus, we have a higher statistical power to draw convincing conclusions. Another strength of our study is the adjustment for possible confounders in the Cox regression. Table 2 shows that the unadjusted HR for AD is 1.66 (95% CI 1.55 to 1.79) in the NTG group compared with the comparison group. Age, female gender and vascular/metabolic comorbidities have been reported to be risk factors of both NTG and AD.16 31 36 37 Thus, these should be adjusted for as confounders to address the association between NTG and AD. Due to the completeness of our database, we obtained inpatient and outpatient medical records of the whole population. After adjustment for confounders, the association between NTG and AD was still significant (HR 1.52; 95% CI 1.41 to 1.63), providing evidence that the significant association between NTG and AD is a real phenomenon. Another strength is that we concentrated on the NTG group to investigate the risk factors for AD. Table 4 shows that among patients with NTG, age, female gender and stroke significantly increased the risk of subsequent AD. To the best of our knowledge, this is the first study to find factors that were associated with an increased risk of subsequent AD among patients with NTG. This finding reminds us to be alert when we identify these high-risk factors among patients with NTG. Previous animal and in vitro studies have revealed that betaxolol and brimonidine eye drops are neuroprotective.38–42 However, in our study, none of the glaucoma eye drops were identified as risk factors or protective factors for AD among the patients with NTG. Further studies are warranted to investigate the issue. In our study, table 3 shows diabetes is a significant risk factor for dementia other than AD (mostly are vascular dementia). This finding is consistent with the previous hospital-based study in Taiwan, which revealed a significant association between diabetes and vascular dementia.43 On the other hand, our study shows diabetes is not a significant risk factor for AD among all the enrolled subjects (adjusted HR 1.05, 95% CI 0.98 to 1.13). However, previous studies found diabetes to be a significant risk factor for AD among the elderly.44–46 To unravel the possible interaction effect of age and diabetes on AD, we performed the Cox regression in subgroups according to younger age and older age. Among those over 65 years, diabetes significantly increased the risk of AD, which was compatible with the results of previous studies.44–46 Even so, the HR in our study (1.02) was lower than the previous population-based study in Taiwan, which had the study period from 1997 to 2007 and revealed a HR of 1.76 (95% CI 1.50 to 2.07).47 The weaker association might result from the better diabetes care in recent years.48 Since poor-controlled fasting plasma glucose and HbA1c are significant predictors of AD,49 the better diabetes care might possibly reduce the development of AD. Our study had a more recent study period (from 2001 to 2013); therefore, the association between diabetes and AD is weaker. The postulation should be investigated in future studies. From our study, we cannot conclude that NTG or its treatment causes AD, because the association of the two diseases may result from their common pathogenesis. In figure 1, the two lines converge from the outset without any latent period, suggesting the same risk factors that influence NTG also influence AD. Further studies are warranted to elucidate the explanations of relationship between NTG and AD. A limitation of our study is that NHIRD does not provide information regarding the severity of visual field defects or visual acuity. Therefore, we could not evaluate whether the risk of AD was positively correlated with the severity of NTG or visual impairment. Future studies including chart review will be conducted to consider these factors. Another limitation is NTG or AD may be underdiagnosed in database studies. Thus, those with NTG may have more healthcare visits, leading to a higher chance of being diagnosed AD. Fortunately, in our healthcare system, NHI covers the fee of the comprehensive, regular health check-up of all beneficiaries. Individuals over 40 years are compelled to receive health check-up once per 3 years and those over 65 years should have once per year. The high accessibility of healthcare ensures the similar chance of diagnosis in NTGs and comparisons if they had AD. It is proved by the similar frequencies of healthcare professionals contacts (excluding ophthalmologists contacts) in NTG and control subjects (10.2±7.6 vs 10.0±7.7 times per year; p=0.08). Even if NTG and AD are underdiagnosed, the misclassification is non-differential and causes toward-the-null bias. The findings from our study have both clinical and public health implications. Clinically, when treating patients with NTG, ophthalmologists need to focus not only on the medical aspects of NTG but also on changes in cognitive function or memory. Patients with NTG at a higher risk for AD, such as older patients, female patients and patients with stroke, should be referred to a neurologist or psychiatrist if early signs of AD become apparent. From a public health perspective, policy makers are encouraged to enforce screening for AD risk in patients with NTG and to provide more substantial and integrated care.
. The Ocular Hypertension Treatment Study: baseline factors that predict the onset of primary open-angle glaucoma. Arch Ophthalmol 2002;120:714–20.
. Prevalence of glaucoma. The Beaver Dam Eye Study. Ophthalmology 1992;99:1499–504.
. Glaucoma in Zulus: a population-based cross-sectional survey in a rural district in South Africa. Arch Ophthalmol 2002;120:471–8.
. The apolipoprotein epsilon4 gene is associated with elevated risk of normal tension glaucoma. Mol Vis 2002;8:389–93.
. Comparison of the neuroprotective effects of adrenoceptor drugs in retinal cell culture and intact retina. Invest Ophthalmol Vis Sci 2002;43:2666–76.
. Hypothesis for a common basis for neuroprotection in glaucoma and Alzheimer’s disease: anti-apoptosis by alpha-2-adrenergic receptor activation. Surv Ophthalmol 2003;48:S25–37.
. Risk factors for vascular dementia: a hospital-based study in Taiwan. Acta Neurol Taiwan 2007;16:22–6. Contributors Conceptualisation: Y-YC, Y-JL, Y-FY, Y-CS and L-WF; formal analysis: Y-YC, Y-JL, C-YW and L-WF; investigation: Y-YC, C-YW, C-YL, K-HL and L-WF; methodology: Y-YC, Y-JL, Y-FY and Y-CS; Validation: Y-YC, Y-FY and K-HL; writing the original draft: Y-YC and L-WF. Ethics approval This study has been approved by the institutional review board of National Yang-Ming University (2015A018). Data sharing statement Data are available from the National Health Insurance Research Database (NHIRD) published by Taiwan National Health Insurance (NHI) Bureau. The data used in this study cannot be made available in the manuscript, the supplemental files or in a public repository due to the Personal Information Protection Act executed by Taiwan’s government, starting from 2012. Requests for data can be sent as a formal proposal to the NHIRD (http://nhird.nhri.org.tw) or by email to wt.gro.irhn@drihn.